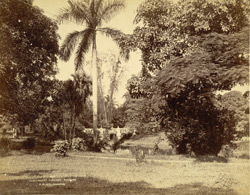 Photograph of the Cantonment Gardens, Rangoon (Yangon), in Burma (Myanmar), taken by Philip Adolphe Klier in the 1890s. This is a general view looking along the small lake in the gardens towards a bridge set amid trees. The Cantonment Gardens were situated within the military cantonment which lay to the north of the city, immediately to the south-west of the Shwe Dagon Paya, and were among several public gardens and parks in Rangoon. They were planned in 1854-56 by William Scott of the Calcutta Botanic Gardens and laid out by the city’s Public Works Department.